After checking out a new farmer’s market yesterday I came home loaded with fruit, including grapefruit, lemons, and strawberries. With the citrus season soon coming to an end, I could not resist the offer of purchasing just-picked grapefruit at a price of 8 grapefruit for a dollar. Faced with the reality that my fridge looked more like a garden/orchard than a refrigerator, I realized I would not be able to consume all of this fruit. So I set out to preserve the grapefruit, thinking it would be delicious paired with ginger. At first unsure of the difference between preserves, jam, jelly, and marmalade, I soon learned that I would be making jam. It turns out that preserves use whole pieces of fruit, jellies use the fruit juice, and marmalade is made using the rind of the fruit as well as the pulp. Since I would be using pieces of grapefruit, but not exactly whole pieces of fruit, I decided my recipe would be a jam. I tried to follow a recipe, but most of the ones online called for steeping the whole grapefruit overnight, or boiling it whole for several hours. I had made strawberry preserves before by simply boiling the fruit with sugar, and decided to do the same with the grapefruit. For this recipe, you need to peel and remove the pith from the grapefruit and lemons and collect all of the juice and pulp in a large bowl. This may feel like a somewhat tedious process when you are doing it, but it is worth it for the simplification of the recipe and will cut down on a lot of wait time. 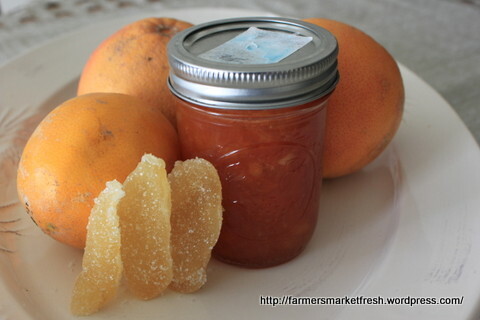 The grapefruit-ginger jam is delicious mixed with plain Greek yogurt or on crackers. Enjoy! Ingredients include grapefruit, lemons, and crystallized ginger (as well as sugar, not shown). Combine all of the ingredients in a medium saucepan and bring to a boil. Simmer uncovered on medium heat, stirring occasionally, for about 45 minutes or until thickened. Follow canning instructions – wash jars with hot soapy water, fill with the preserves (leaving 1/4-1/2 inch space at the rim), and immerse in boiling water for about 5 minutes (making sure the water covers the jar). Remove jars from boiling water and let your preserves cool.